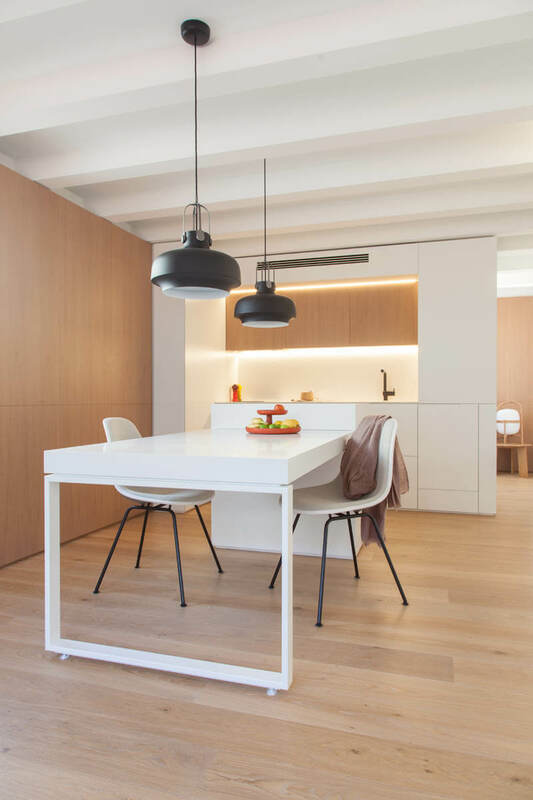 The project from YLAB Arquitectos in Barcelona’s trendy Grácia district was for the refurbishment of a former concierge’s apartment, located on the roof of an old Barcelona property in the Grácia area of the city. 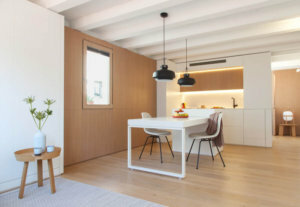 With its privileged views over the adjacent buildings and a surround terrace the apartment did however present some interesting problems to resolve, one of which was its diminutive size, of just 38 sq.m..
An Australian couple wanted to reform the apartment for use as a holiday home in Barcelona, with the emphasis on the day spaces. They wanted a warm and comfortable living area that was functional with optimum versatility and storage space. From a practical point of view the solution was to create a main space with a kitchen and island within the living area. At night this space becomes a bedroom via the lowering of a fold out bed that is hidden in a wardrobe. Through the kitchen a more private zone leads to a dressing area / studio with access to the bathroom. The design concept focuses on the spatial envelope, walls and ceilings are covered with made to measure crafted wood panelling that alternate satin lacquered white with a more clear oak veneer. These panels around the perimeter walls are also functional storage elements that make the most of the limited space available as well as integrating the various spaces and providing a quality finish. The resulting apartment is a small but light filled and warm space where the details reflect its simple and pure design concept. In a similar manner the windows, the openings of which could not be moved, are replaced by new window frames finished in the same oak veneer and integrated within the overall envelope. Wall claddings conceal cabinets with different depths and functions. The flooring is finished in light oak wood parquet that compliments the wood of the rest of the apartment walls. The original ceiling of concrete beams is also clad with white wood, disguising its imperfections and in-built services. The nucleus formed by the kitchen / dressing studio cabinet is finished in white lacquered panels, and is the only element that divides the space. The upper part hides the air conditioning equipment that works by pushing air through grills in the front. The kitchen includes a small work space with oak top cabinets and hidden LED lighting. 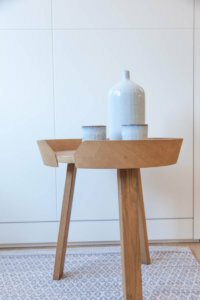 The island extends the work surface and forms a dining table finished in the same material as the kitchen surfaces. Two hanging and traditional lamps together with the Vitra chairs complete the furnishings set against a wall and window completely clad in oak panels. The room, at the rear of the apartment features an elongated window with a white mural panel that hides the fold-out bed and storage space. The furniture here is light and easy to move around such as the Paulistano armchairs, the Marset floor lamp and a Muuto side table. The dressing area is also provided with floor to ceiling wardrobes, in white. The exterior wall, with an oak frame window, has a hidden desk that comes out of the wall with a hinged writing surface and several drawers. This area also gives access to the bathroom which is clad in white porcelain tiles with a cement shower tray and a generous wash hand basin that also features oak panelling.